RotoDerby debuted last season to great success and is back for another year of Longball Derby's! 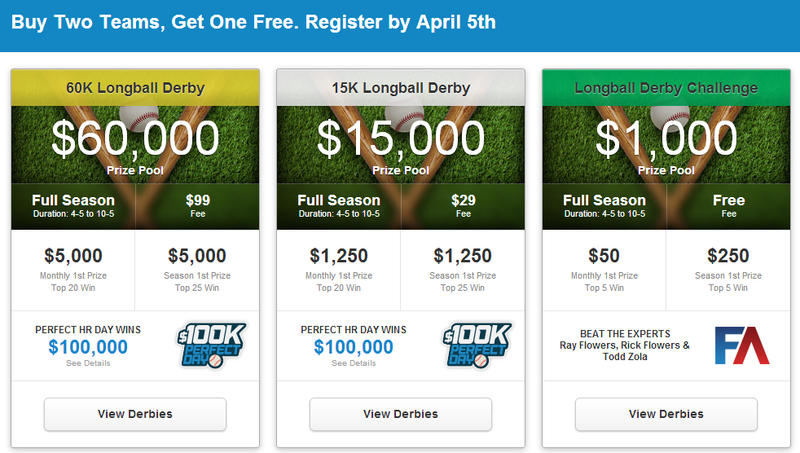 You can win both Monthly and Season-end cash prizes within the same Fantasy Derby Contest and they gave away a LOT of money last year! Each Derby is based on 3 stats but weighted towards a main scoring stat (for example in Longball Derby, HRs = 5pts, RBIs = 1pt, Ks = -1). That’s it no other stats. The Derby uses fixed starting rosters for the entire season (eliminates the high maintenance needed to set rosters daily or weekly). One-time setup. Derby standings reset monthly – so you can win each month and at season end (as opposed to winning just once at the end of the season). Each Derby is not limited to 8 to 12 teams. With Fantasy Derbies your entries are unlimited, allowing you to compete against more teams for larger Monthly and Season-end prizes. Its as simple as Draft, Score and Win! Whatever strategy you choose, RotoDerby puts you back in control of your time to spend it as you wish while getting back in the game you love to play.